Gandhi's fundamental contribution in the field of religion was to give primacy to Truth rather than conformity to traditional practices. In fact he made Truth the basis of all morality by declaring: "I reject any religious doctrine that does not appeal to reason and is in conflict with morality ... God did not create men with the badge of superiority or inferiority; no scripture which labels a human being an inferior or untouchable because of his or her birth can command our allegiance. It is denial of God and Truth which is God". Though a deeply devout Hindu, his approach was 'sarvadharma samabhav' (equal respect for all religions) and a "spiritualized humanism". All religions had equal status and were different paths to the same goal of achieving union with the Divine. His religion was that "which transcends Hinduism, which changes one's very nature, binds one indissolubly to the truth within and ever purifies. It is the permanent element in human nature which leaves the soul restless until it has found itself". He affirmed "For me different religions are beautiful flowers from the same garden or branches of the same majestic tree". He often said he was as much a Moslem, Christian, Sikh, Buddhist, Jain and Parsee as he was Hindu and added "The hands that serve are holier than the lips that pray". At his prayer meetings there were readings from all the holy books. His favorite hymn began with the line "He alone is a true devotee of God who understands the pains and sufferings of others". He affirmed "Independent India as conceived by me will have all Indians belonging to different religions, living in perfect friendship." In 1931 he wrote in Young India "It has been said that Swaraj will be the rule of the majority community i.e. the Hindus ... If this were to be true, I for one would refuse to call it Swaraj and would fight it with all the strength at my command, for to me Hind Swaraj is the rule of all the people and the rule of justice." On January 23, 1948, just a week before his assassination he declared "It would spell the ruin of both the Hindu religion and the majority community if the latter, in the intoxication of power, entertains the belief that it can crush the minority community and establish a purely Hindu Rashtra". Lauding this enlightened approach Fischer wrote "Mahatma Gandhi, a supremely devout Hindu, was incapable of discriminating against anyone on account of religion, race, caste, colour or anything. His contribution to the equality of untouchables and to the education of a new generation which was Indian instead of Hindu or Moslem or Parsee or Christian has world significance." "What does Jesus mean to me? To me, he was one of the greatest teachers humanity has ever had." "Jesus was the most active resister known perhaps to history. 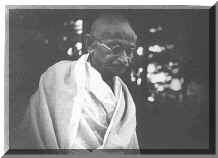 His was non-violence par excellence"
"Jesus expressed as no other could, the sprit and will of God. It is in this sense that I see him and recognize as the Son of God. And because the life of Jesus has the significance and the transcendency to which I have alluded, I believe that he belongs not solely to Christianity but to the entire world, to all races and people. It matters little under what flag, name or doctrine they may work, profess a faith or worship a God inherited from their ancestors"
On seeing a painting of the crucified Christ in Rome, Gandhi remarked "What would not I have given to be able to bow my head before the living image of Christ crucified. I saw there at once that nations like individuals could only be made through the agony of the cross and in no other way. Joy comes not out of infliction of pain on others but out of pain voluntarily borne by oneself." Gandhi's knowledge of and respect for Christ however came after he went to England and South Africa. In his youth he had in fact a strong aversion to Christianity. In his autobiography he writes that whereas from his parents, who had many Jain and Moslem friends, he had learnt to respect religions other than his own "Christianity at that time was an exception. I developed a sort of dislike for it and for a reason. In those days Christian missionaries used to stand in a corner near the high school and hold forth, pouring abuse on Hindus and their Gods. I could not endure this. I must have stood there only once but that was enough to dissuade me from repeating the experiment. About the same time, I heard of a well known Hindu having been converted to Christianity. It was the talk of the town that when he was baptized he had to eat beef and drink liquor, change his clothes and thenceforth go about in English costume including a hat. I also heard that the new convert had begun abusing the religion of his ancestors, their customs and their country. All these things created in me a dislike for Christianity." In London, towards the end of his second year there, he was first introduced to Theosophy, and then to the Gita and Buddhist teachings. Soon thereafter he met a devout Christian in a vegetarian boarding house, who spoke to him about Christianity. Gandhi revealed to him his aversion to it from his school days in Rajkot. The Christian replied "I am a vegetarian. I do not drink. Many Christians are meat eaters and drink; but neither meat eating nor drinking is enjoined by scripture. Do please read the Bible". Gandhi accepted his advice and began reading the Bible. The Old Testament bored and parts of it repelled him, but the New Testament, particularly the Sermon on the Mount "went straight to my heart" and "I tried to unify the teaching of the Gita, the 'Light of Asia' and the Sermon on the Mount. That renunciation was the highest form of religion appealed to me greatly" he wrote. When his concept of Trusteeship was criticized as too idealistic and impractical Gandhi wrote "The question we are asking ourselves today was addressed to Jesus two thousand years ago. St. Mark has vividly described the scene. Jesus is in a solemn mood. He talks of eternity but is the greatest economist of his time. He has succeeded in economizing time and space; he has transcended them. To him comes a young man, kneels down and asks "Good Master, what shall I do that I may have Eternal Life? Jesus replies "Thou knowest the commandments. Do not commit adultery, do not kill, do not steal, honour thy father and mother." The youth answers "Master, all these I have observed from my youth" Then Jesus says to him "Then go, sell whatever thou hast, give to the poor and thou shall have treasure in heaven". At this the youth goes away grieved for he had great possessions, and Jesus says to his disciples "It is easier for a camel to go through the eye of a needle than for a rich man to enter the Kingdom of God." Here you have an eternal rule of life stated in the noblest words in the English language…. I will not insult you by quoting in support of what Jesus said, writings and sayings of our own sages which are even stronger. The strongest testimony in support of it however are the lives of the greatest teachers of the world, Jesus, Mohammed, Buddha, Nanak, Kabir, Chaitanya, Shankara, Dayananda, and Ramakrishna. They all deliberately embraced poverty as their lot. In volume 1 of his ten volume 'The Story of Civilization' eminent historian Will Durant lauds Gandhi thus "He did not mouth the name of Christ, but acted as if he accepted every word on the Sermon on the Mount. Not since St. Francis of Assisi has any life known to history been so marked by gentleness, disinterestedness, simplicity and forgiveness of enemies." For Martin Luther King: "Mahatma Gandhi was the first person in human history to lift the ethic of love of Jesus Christ, above mere interaction between individuals and make it into a powerful and effective social force on a large scale. If humanity is to progress, Gandhi is inescapable. We may ignore him at our own peril". When an American churchman upbraided him for this he replied "It is ironic yet inescapably true that the greatest Christian of the modern world was a man who never embraced Christianity.